UK-based Innervision Design Ltd has now released G-Calc 2015, a MicroSoft Windows-based calculation tool. 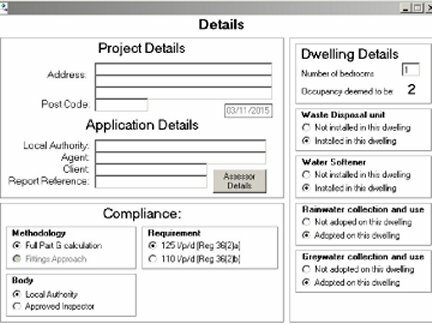 G-Calc 2015 facilitates compliance checking to the latest Building Regulations - Approved Document Part G 2015 Edition. G-Calc 2015 now supersedes the previous version G-Calc 2010, which has been widely used by architects, energy assessors, sustainability consultants and other building professionals across the country. Incorporation of a fittings approach as an alternative to using the full water efficiency calculator. Generating a “Notice of Water Efficiency” as required by the Building Regulations. G-Calc 2010 software will continue to apply to work started before 1st October 2015, for example, work subject to a building notice, full plans application or initial notice submitted before that date. For further information on G-Calc 2015, please contact us on 01279 862447 or visit http://www.innervision-design.co.uk/water-calculations-and-part-g-software.php.